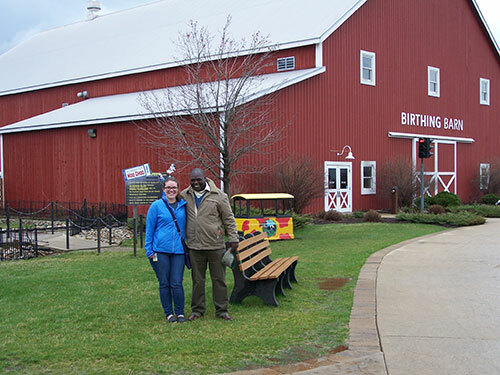 Purdue Veterinary Medicine welcomed Dr. Campaign Limo, a mobile veterinarian from the Kenya Wildlife Service (KWS), who traveled to the College of Veterinary Medicine last week. PVM students who had worked with Dr. Limo on his mobile vet unit last year in Kenya spent some time showing him around town, the Veterinary Teaching Hospital, Fair Oaks Farms, and the rest of campus. Throughout the week, Dr. Limo lectured on his experiences working with wildlife and conservation medicine throughout the Masai Mara Conservation Parks. On Wednesday (March 29), he met with the Purdue Exotics Club to share some of his most memorable case studies throughout his experience as a wildlife veterinarian. 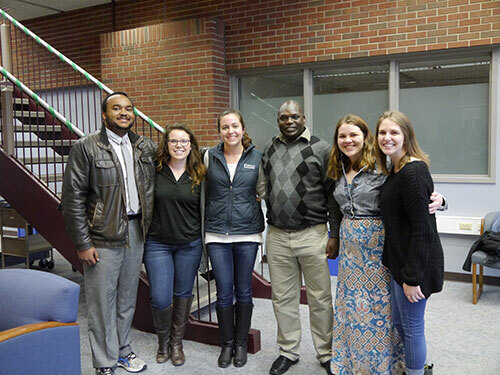 On Friday (March 31), Dr. Limo met with the Purdue International Veterinary Student Association (IVSA) to discuss poaching and human-animal conflict throughout the wildlife conservation parks in Kenya as well as the efforts of KWS to ease these struggles. Later in the evening, Dr. Limo was honored at the IVSA Spring Event with a certificate of appreciation presented by Dean Reed. The evening included a reception with delicious Kenyan dishes that Dr. Limo qualified as, "taking me back home." The Office of International Programs also presented the first International Veterinary Medicine Certificates to PVM students who had met several requirements, some of which include: studying abroad, learning how to market their experiences abroad, and participating in various workshops. Dr. Limo spoke at the event where he expressed his deep gratitude to the College, his continued commitment to PVM students, and his pursuit of having a Letter of Intent finalized in Kenya with Purdue Veterinary Medicine. Director of International Programs Will Smith adds, "PVM is dedicated to providing all of our students with transformational international veterinary experiences. We thank Dr. Limo and the KWS for their continued conservation efforts throughout Kenya and their willingness to allow our students to take part. We hope this relationship will continue to grow." Dr. Limo (right) and Taylor Smith, of the DVM Class of 2018, take a break during a trip to Fair Oaks Farms. 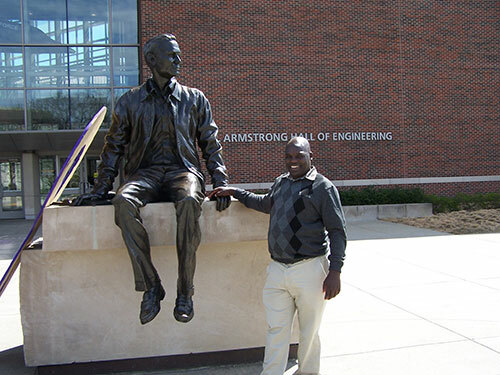 Dr. Limo pauses in front of the Neil Armstrong statue during a tour of the Purdue campus. William Willis, of the DVM Class of 2020; Taylor DeWitt, of the DVM Class of 2019; Kimberly Lutz, of the DVM Class of 2018; Taylor Smith, of the DVM Class of 2018; and Brenda Najar, of the DVM Class of 2019, join Dr. Campaign Limo at the IVSA Spring Event on Friday, March 31. 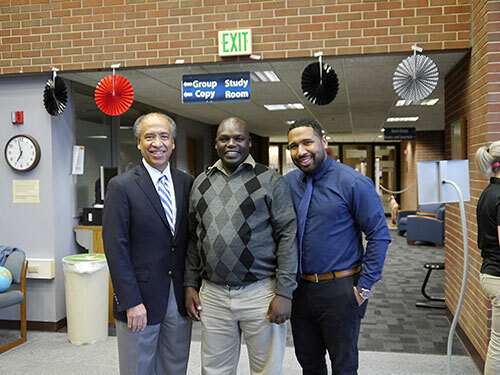 Dean Willie Reed, Dr. Campaign Limo and Director of International Programs Will Smith pause for a photo Friday evening at the IVSA Spring Event.